Rennlist - Porsche Discussion Forums - Custom Ordering a 981, 'Porsche Exclusive' and You! This thread's purpose is to shed some light into the sometimes opaque world of 'Porsche Exclusive'. And to disseminate some of information I have gained from past Porsche ordering experiences and current research into custom ordering a 991 and/or a 981. I hope that others join in and share their ordering experiences so that we can establish a well documented thread that is helpful to others that are contemplating custom ordering their cars. In general, Americans rarely custom order a Porsche. Most just buy what dealers have ordered, which are often 'safe' choices that appeals to an 'average' buyer. It's no wonder that so many 991's and 981's are & will be spec'ed pretty much the same in so many regional markets. 'Porsche Exclusive', if used wisely, opens up a whole new world of personalization for you & your car which is relatively rare to find today in the mass-production automotive industry. Mercedes and BMW offers no equivalent program in the US. Only 'Audi Exclusive' offers something similar. The many different choices available through 'Porsche Exclusive' sometimes can overwhelm the 'average' Porsche customer. And few dealers have experienced sales staff that knows the inside/out of custom ordering a car and the intricacies of 'Porsche Exclusive'. So YOU will have to do your own homework and research before you can successfully master this complex ordering system. I hope this thread lifts the veil on some of the custom ordering process at Porsche and helps some of you achieve the perfect 981 spec! I am not affiliated with PAG, PCNA or any dealer, so all of this is being done is the spirit of 'Liebe Zu Ihm'. Timing: Available for a limited time window during the model year. Opens and closes depending on series production scheduling. In the initial limited period of MY2012 991, it was open briefly then closed as MY2013 production was about to start. Now it appears to be open again for MY2013 991 and 981. Could close on the MY2013 991/981sometime in the late Fall or early Winter of 2012, but apparently nothing yet has been communicated to dealers. Seems like the factory likes to bunch up PTS requests in batches and tries to do them all in a row. If you know something about the complicated process of auto painting technology, you probably will understand why! So always check that the window for PTS is open so that you are not disappointed by being shut out due to the factory 'fickle' PTS scheduling! Colors Available: Any...as long as it passes a very strict and severe test conducted by PAG in Zuffenhausen with the assistance of their current paint supplier - Dupont. Some colors that are deemed proprietary to a model (e.g. Speedster Blue or Sport Classic Grey) are often 'off-limits'. Some that are registered trade-marks of corporations (e.g. Gulf colors) might also be currently prohibited. Overall, what Porsche is looking to do is limit customer complaints that might trigger costly warranty claims and consumer dissatisfaction of mis-matched colors on any part of the vehicle. Since the materials now used in cars involve steel, plastic, carbon fiber, etc, it is important that colors don't fade at a different rate on the varied surfaces of a modern Porsche! The process of determining suitability could take weeks or months. It only starts after you place the order with your dealer and it sends an actual 'sample' metal piece painted (minimum size of a business letter) with your desired PTS color to the factory in Germany. So this 'Paint to Sample' process is not for those that are in a hurry in getting their 981's or are easily upset by a possible rejection of your color selection! But perseverance will reward your efforts with a fairly rare, or even unique, color on your special vehicle! To their credit, PCNA has actually issued a document on 6/4/2012 which told dealers of PTS colors that they have already tested and pre-approved. This is a tremendous advantage for those of you willing to select one of those pre-approved colors because you don't have to submit color 'samples' and wait in limbo! It means you quickly pass 'Go' and your car can be quickly scheduled for production! That is enough to digest on the first day! Thanks for sharing, Z356. I'll be placing a custom order for a 981S in about six months, but I won't be ordering anything exotic. I usually order the base car with only about $5K in options which by Porsche standards is about as plain Jane as it gets. Would the Creme White be the Chiffon White from the 80's? Thank you! Isn't Ipanema blue metallic a turbo s color? Don't know if its close to the old Chiffon, but maybe. All I can tell you that it was a special color ($3K+ option) at least for MY2011 & MY2012 997's/987's and it didn't have many takers! For example, you can count in your hands how many Spyders were done in that color for those two model years in the US! This particular Ipanema color was introduced fairly late in the MY for the last of the 997.2's and could be ordered on any 911 model, not just Turbo S's. I have only seen one ever - on a 2012 GTS. Are you ready for 'AMBER ORANGE' leather interior on your Porsche? OK, for my next post on this thread, perhaps we can make a bit of internet news! I will reveal the photos of the new AMBER ORANGE leather interior color scheduled now for production on the 981 (and perhaps optional in the 991 in the future?) soon to hit our shores! See attached photos below. I have yet to see a finished car done with this interior. If any of you have, please provide us with a link! The name 'Amber Orange' is a bit deceiving. I would consider it almost a member of the 'brown' family of colors, just brighter but with a decidedly hint of an 'orangy' overtone! This will be available for the 981 in what the configurator calls a 'two-tone' color combination, in conjunction only with 'Agate Grey' leather. PAG calls this type of offering a 'Leder Bicolor' and it translates to English as 'Leather bicolor'. More importantly, this BiColor combination will sport a very significant 'orange' deviating color stitching on the 'Agate Grey' leather dash and top door panels which will be very striking and noticeable! I urge you all to go to the PCNA website and 'built your own' 981 in this color combination with 3D! It is absolutely stunning! It is also very reasonably priced and includes the extra deviating stitching (normally over $1000 of extra costs if ordered 'a la carte'). I will talk more about all the 'two-tone' interior combinations in an upcoming post on this thread. To me, these 'Bicolors' are the most interesting offerings currently available from Porsche on the new 981 and 991 models! The trick is to match them correctly to an exterior color! But for today, I wanted all of you to see for yourselves what 'Amber Orange' looks like! Although this new 'Amber Orange' color is initially offered only on the 981, I believe that this leather color MIGHT be available for mix & match into panels in the 991, but only by special request! And perhaps a similar 'BiColor Leder' option with 'Agate Grey' leather may be offered on the 991 in the future. That is why I am also posting this information on these 991 forums so you are aware of this 'new' leather color choice from Porsche. I took these pictures at the Salt Lake City PCA Parade which just concluded less than two weeks ago! They were graciously shown to me by Sascha Glaeser who is 'Manager, Customer Consultation', for 'Porsche Exclusive' in the US. A few preliminary words about Sascha Glaeser. He is based in Los Angeles. His assistant, Melissa Witek, is based in New York. In future posts, I will describe in greater detail all the good work they are both doing to liven up our cars via the exquisite offerings of 'Porsche Exclusive'! PAG has assigned Sascha to the US after working for 'Porsche Exclusive' in Germany. 'Beautiful Melissa', as I like to call her, was hired here in the States. They work with both US dealers and individuals to educate them on the various possibilities open to North American customers of Porsche via 'Porsche Exclusive'. I hope the information on my thread will make all of you better informed so that when you finally talk to either Sascha or Melissa on your prospective orders and make those conversations more productive! I personally want to thank Sascha for all the time he spent with me in Salt Lake City (and previously helping me with my custom ordered Aqua Blue/Carrera Red MY2012 Spyder). Without his help, I would have very little to share with you on this forum! Thanks Eduardo! Keep it coming. I can't resist the custom config. options. I will probably order a car just to go through the process! It looks like the orange is plenty bright? Any word on Slate gray Non-metallic? Or any Alcantara options? Wow! This thread has the potential to be an incredibly valuable resource. Thank you, Eduardo! I will be watching this one very carefully. It seems for sure that the only 'Natural' leathers offered, on the face of it, are 'Carrera Red' and 'Espresso'. So what are the 'un-natural' leathers being offered to us by Porsche? Over at the 6speed forum, member 'jmmk' recently gave us a very interesting tutorial which might help explain things better for us. "Leather is a starting point for a car manufacturer. With the base leather, the leather is stretched and the outer layer is sanded off and a new grain is embossed into it to make it more uniform. This increases the porosity of the leather when the outside is sanded off and it accepts color better. However, it doesn't hold up as well unless a sealer is applied. So the "leather" interior is considerably changed from its natural state. It is now thinner, uniform in both grain and color, and sealed against UV and infrared damage from the sun, making it suitable for an automobile use. Since it is stretched thinner you don't notice that it is slightly stiffer. It could be dark black or dark grey according to what the designer wanted. Full leather has nothing to do with what kind of leather is used, although the designer might specify a better grade if their research indicates the consumer expects it with the cost upgrade. Natural leather is not stretched. It is natural thickness and has the natural grain still intact. It is tumble dyed in large drums that constantly roll and knead it to get it to accept the color. This softens it much like you would soften a dry chamois by kneading it. It retains the natural, saddle-like leather smell without adding synthetic aromas. The comfort, if you took the time to compare it, is obvious to the educated rear end. Even though less is done to cure leather this way, it is still more expensive since you get fewer square feet of leather out of a hide. The UV and infrared sealants are introduced into the leather while it is tumbling in the dye soaked drums and like the dye, is soaked all the way through the leather rather than added with the sealant. Additional leather options in a Porsche, beyond the full leather option, show the skill and technology that Porsche craftsmen are capable of. For leather air conditioner vents, the leather is stretched almost paper thin to cover the plastic vanes of the outlet. Also, the match between what is leather and what is similar to leather is outstanding by automobile standards." Over the years we have also heard the term 'aniline leather' to signified what is referred to by 'jmmk' and Porsche as 'Natural'. Wikipedia describes it as "Aniline leather is a type of leather dyed exclusively with soluble dyes without covering the surface with a topcoat paint or insoluble pigments. The resulting product retains the hide's natural surface with the 'grain', i.e. visible pores, scars etc. of the complete original animal's skin structure. Originally, the dyes used for this process were synthesized from aniline through chemical reactions. These dyes used to be called 'aniline dyes' or 'tar dyes'. In modern times, the dyes used are subject to laws and regulations in many countries, and the use of certain azo compounds is prohibited as there are reasons to assume health risks. Typically, leather is dyed both for aesthetic reasons and to conceal blemishes. The dye colours leather without producing the uniform surface of pigmented leather. Any visible variations on the surface of the undyed leather such as natural blemishes will remain visible. There are different kinds of aniline leather, but the same kinds of dyes are used in the process. 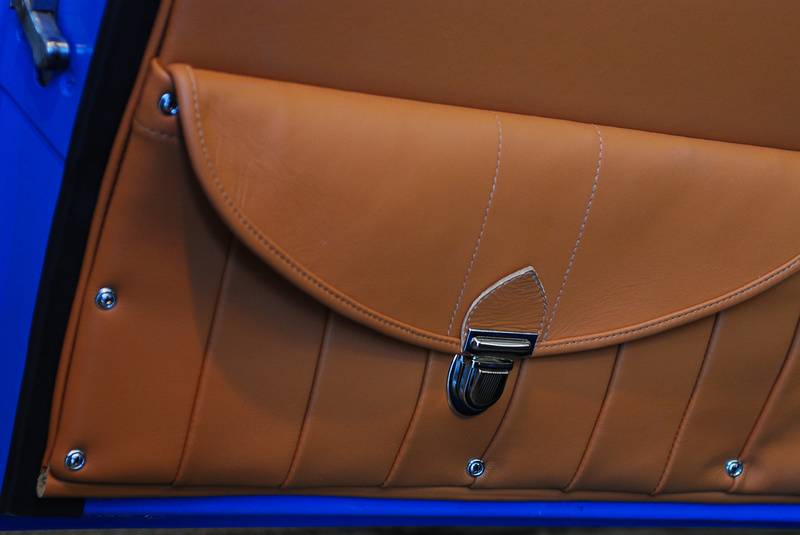 The dyes used are clear and transparent chemicals that allow the grain structure of the leather to be seen. These dyes show the natural texture, but do not protect the leather from damage. Aniline leather may be referred to as full aniline or full sauvage leather to differentiate between this dye treatment and variants. Semi-aniline leather is produced through a very similar process to full-aniline, but has a thin protective top coat added to protect it from wear and staining. Pull up aniline leather has additional oil or wax applied to the leather to give it a distressed look'. So it seems that the 'standard' leather offerings from Porsche are not 'natural', or 'aniline', or even 'semi-aniline'. These 'base' leathers on the 981 include the colors 'Black', 'Platinum Grey', 'Yachting Blue' and 'Luxor Beige'. Also not categorized as 'Natural' leathers are these other leather offerings: a) 'Special Leathers' in the color 'Agate Grey'; and b)Two-Tone (BiColor) 'Agate Grey/Pebble Grey' and 'Agate Grey/Amber Orange'! An interesting new Bi-Color - 'Agate Grey/Lime Gold' - is only listed for partial leather seats but I would hope it can be available in full leather combination too. I will have to inquire about that. 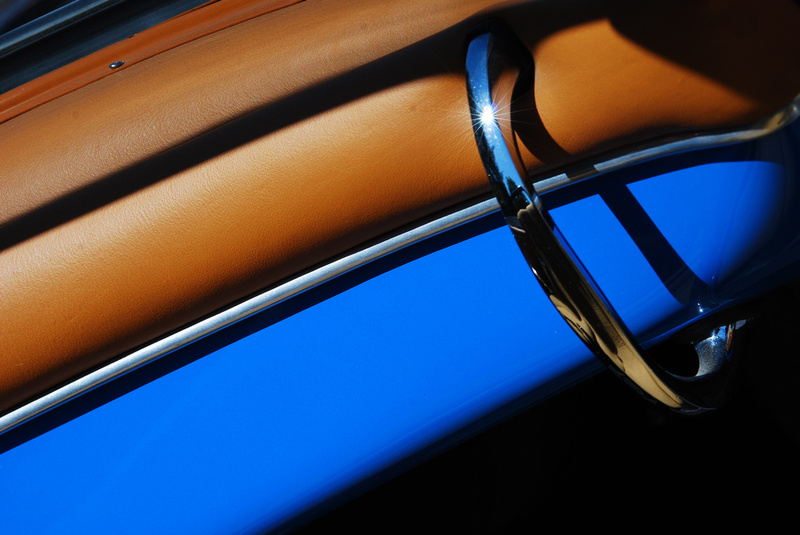 Only 'Carrera Red' and 'Espresso' fit into this 'premium' or 'exclusive' Natural / 'aniline' leather designation! Note that Umber is offered on the 991 but not on the 981! On the other hand, neither 'Agate Grey/Amber Orange' or 'Agate Grey/Lime Gold' is offered on the 991! I believe that 'Custom Colors', which from now on I will simply call 'Leather to Sample', can be had in either 'base' leather (if particularly colorful) or in 'Natural', if that particular leather grade is available in the color you desire. 'Leather to Sample' is a seldom selected option here in the US. It is more common to markets like the Middle East/Gulf States. I will make it my business in the next few months to inquire more on this subject. Personally, I find the standard 'Black' in the base leather as offered by Porsche not to be particularly desirable. So I would like to know if they can provide us in 'Leather to Sample' a deeper 'Black' leather in 'Natural' upscale grade that will be darker in color & richer than the standard 'Black' offered. Others have commented that the new standard 'black' seems to be a bit more 'charcoal' this year than they remember in the recent 997/987 models. I am also fascinated by the previous 997.2 offering of 'Natural Brown' leather, which was a beautiful color and of great quality! More about this when I talk about 'Leather to Sample' on a future post on this thread. Note that the leather colors for the new 981 are almost all new to the Boxster/Cayman model range. The only true carry over is 'Carrera Red' Natural leather. I believe that the base 'Black' is slightly more 'charcoal' than in the outgoing 997/987, but I could be wrong. 'Agate Grey', 'Platinum Grey', 'Yachting Blue' are totally new offerings! 'Luxor Beige' has apparently replaced 'Sand Beige' and 'Espresso' Natural was added to 'Carrrera Red' as a 'Natural'. The Dual-Tones (BiColor) are all new to the range. Note they are not 'Natural' leathers and in the 981 can be had with partial leather combinations (not available to the 991)! Some have wondered why a Dual-Tone (BiColor) 'Black/Carrera Red' is not yet offered. I don't know the answer but note there is a mismatch of grade quality given the 'standard' black with the 'natural' Carrera Red. Perhaps that is one of the reasons it is not yet offered! There is the possibility of mix & matching via other 'Porsche Exclusive' options, and we will talk about that on another day. Colors of leather fall within the range of personal taste. I will not comment on that subject, but I will explain in greater detail the new 'BiColors' in my next post. I think these BiColors are some of the most interesting offerings yet from Porsche and deserve particular attention as to what they offer. The new Two Tone (BiColor) interior offerings from Porsche are worthy a separate discussion on this thread. Although Porsche offered some limited two tone interiors in the past, the ones for the new 991 and 981 are especially significant because they are also combined with very distinctive deviating stitching in 'key' upper panels. These are very similar to the interesting BiColors introduced very late in the 997.2 model range (e.g. MY2012), although one of my favorites - 'Black/Sand Beige' - was seldom ordered by customers or dealers on its debut. That is why I am highlighting these BiColor options for you today. I believe when customers get more familiar with them and what flair they offer your car's interior, they will become very popular with Porsche buyers on the 981! These new BiColors are all color coordinated to their matching lower panel colors and look positively smashing! For a great number of prospective new owners that have often thought of ordering deviating stitching but gave up because of the complexity and color decision process, this is a ready-made coordinated package from 'factory' that has great appeal and it's easy to do! In addition, it's a bloody bargain! The BiColor option is $430 extra on a 'Full Leather' interior or $140 for 'Partial Leather', according to the PCNA Configurator for the 981! On the 981, you get to choose from three BiColor choices: 'Agate Grey/Amber Orange', 'Agate Grey/Pebble Grey'*, and 'Agate Grey/Lime Gold' (Photo #1 & #2). The later is shown on the PCNA Configurator as available only in 'Partial Leather', but which I hope it's also allowed in 'Full Leather. I will check soon with 'Porsche Exclusive' to confirm what can be done in this unusual BiColor 'Lime Gold'. As I have mentioned on a previous post, the challenge will be to match these BiColor interior options to an acceptable 'exterior' color! a) It visually helps 'enlarge' the 981's cabin space by the lighter color under panels! b) Reduces glare on front windshield since dash is dark color. A common objection to lighter color interiors! b) The deviating stitching is just enough to make the whole interior 'pop'! c) It is an easy, no-fuss way to distinguish your interior from the drab 'black' so often favored by Teutons over at the Fatherland! d) Leather Steering Wheel is color coordinated to your BiColor interior! d) It is a bargain as far as normal 'Porsche Exclusive' options go! I don't have yet any photos of 981's in these special Two Tone/BiColor options. But these can be already seen in the new 991's. The second set of photos below are of 'Agate Grey' Cabriolet with 'Agate Grey/Pebble Grey' interior. Photos were taken at 'Porsche of Colorado Springs'. I hope some of you seriously consider these great new options on your next Porsche 981! *I want to thank 6speed forum member 'Shineman' for alerting me to an error on my original post. 'Black/Platinum Grey' option is not yet available on the 981! What is available is 'Agate Grey/Pebble Grey'. He was a bit confused about the cost I quoted. Please note that the amount I quote is ON TOP OF WHAT YOU NEED TO PAY FOR either 'PARTIAL' or 'FULL LEATHER' option of standard color. For example, the minimum cost Porsche charges for 'Full Leather' with 2-way electric 'Sport Seats' is $2,385 on a 981. If you want Two Tone 'Full Leather', you add $430 to that amount per PCNA Configurator. I hope this is clear to most of you! Anyway, the base 911 upholstery (described in the US sales brochure, etc. as "partial leather seats") is described as "gepragtem leder" (with two dots over the a) or embossed leather. Specifically, this embossed leather is on the seat centers, bolsters and headrests. The steering wheel and other leather parts are described as "glattleder" or smooth leather. The leather seats option ($1,555 on US. 991s) is described as smooth leather, as is the full leather interior option ($2,385 on 981s, $3,690 on 991s). From the discussion Z356 has quoted above, it seems clear that all of these variants are the srtetched, thinned, sanded, etc., leathers rather than the natural leathers. New Options About to be Announced! I am going to interrupt my sequence of topics for just a bit and talk to you briefly about new options about to be announced! This is always a delicate subject because Porsche AG, PCNA, the local dealers and your salesman in particular do not want anyone to hold up their order or postpone their buying decision based on future options availability. But I don't work for PAG, PCNA or a dealer, so I am more interested in getting you the facts so you can decide what & when to buy..and create the perfect spec on your next Porsche! Porsche AG will finally adopt this incredible technology and incorporated into the 991. I have experienced this technology in two previous BMW's (a '04 745i Sport and a '07 650i Vert) and currently have it on my '07 CL600 (where its called Distronics Plus). Before any of you make a decision that such technology is totally superfluous on a sport car, please do a little research & keep an open mind. Even those of you that mostly use your Porsches at the race track have to travel long distances to get there & back. It also has a safety function called a Precrash system, which warns the driver and/or provides brake support if there is a high risk of a collision. This feature is called 'Porsche Active Safe' (PAS) in Porsche's version of ACC. The system is probably radar based (Bosch) and will be fitted in the lower center part of your front bumper (see attached representation). When ordered in conjunction with front parking sensors, the latter are relocated to the extreme right & left corner of the grilles, which is something already seen in Spy photos of certain models (e.g. testing mules of upcoming 991 Targa). It will be interesting to see where they put the additional front center radiator that is part of the 'desert' option for extreme heat markets. The ACC is located where that normally goes! Initially this option is being offered on the 991. I don't know yet when it will be extended to the 981. The anticipated cost here should be around $2000+, but I have not yet seen it publicly announced by PCNA! It is around approx. $1714 in one Gulf State market when converted from the local currency. I have loved every application of Adaptive Cruise Control I have own and strongly recommend it to a prospective Porsche owner on your next order! These have been offered by Porsche before in the 997 and others. The reason it was not offered at the 991 introduction was because of technical issues that required more R & D. As you all know, the 997 had a door alignment feature integrated into the jam area on the chassis. In the 991, this feature is now located in the bottom & center of the actual door and it slides into a cavity that sits just below the entry sill! Apparently, it took some experimentation to make sure that the electrical wiring required for illuminating the sills were properly safeguarded before this option was offered in series production! As expected, the Illuminated Sill Guards will highlight the model you have ordered (Carrera, Carrera S, etc). It is my understanding that when the 'Powerkit' option is available to us, you will be able to order one with 'Power Kit S" or something to that effect! The anticipated cost here should be just under $1000, but I have not yet seen it publicly announced by PCNA. Available in the recent past. I ordered it on my '12 Spyder. The anticipated cost here should be around $465 (as it was last year) or below! The anticipated cost here should be around $675 (as it was last year) or below! "Deviating stitching in steering wheel rim. Note: stitching available in Silver, Racing Yellow, Guards Red, Black, White, Platinum Grey, Pebble Grey, Cream, Yachting Blue, Luxor Beige, Espresso., Umber, Aqua Blue, Peridot, Amber Orange, Agate Grey, Limegold, Cognac, Carrera Red. For multifunction steering wheel (order no. 844) only available in conjunction with PDK (order no. 250)" . It is not clear to me if the deviating stitching option will be offered on both the standard steering wheel (batman style) or the optional 'Sport Design' wheel. But I anticipate it will be offered on both! Don't know yet the pricing but it should be reasonable. Available in the recent past on the .2 997 gt3, RS, GTS, Spyder & Cayman R. Expected to be offered in the US shortly. Remember that PCNA makes decision as to what factory options to allow in US market based on our individual market, demand and dealer's input. Sport Buckets with the integrated airbag was first offered here on the MY2008 gt2. I was then briefly seen in some MY2009 .2 997 (e.g. Intro Meteor Grey C4S) and then offered as standard on the .2 gt3, gt3 RS, gt2 RS, Spyder, Cayman R, GTS, and 4.0 Limited Edition gt3 RS. On cars ordered by dealers for inventory, you rarely saw them as they were considered too restrictive and unpopular according to them! On custom order cars, they were almost always present. Suggest if you want to see them again offered here in US in anything other than future 991 gt3 & RS that you contact PCNA and make your case! If enough folks demand it, it will be offered! I have them on my '12 Spyder and they are very comfortable after you get in them and are on the road! However, they don't allow for adjustments, other than front to rear slide. So depending on your body built and height, they are not universally suitable for everyone! Don't know yet about pricing on regular 991's & 981's if offered, but they will be a no charge standard seating on the gt3/gt2 models and future Spyders and Cayman R's. My understanding is that an improved & fully adjustable 'sport bucket seat' is being developed for the 918 Spyder! I know the in-house Porsche designer that is working on it. Once that seat is fully tested then introduced in the exclusive Spyder model, expect a 'pedestrian' version of that improved & adjustable 'sport bucket seat' to be introduced in series production vehicles! The options described above are far along in development at Zuffenhausen and already appear in the Configurators in some markets. Some are available already for ordering and are being done at the factory as we speak. Others are being accepted for production orders on cars that will be built this Fall and beyond. The ones that I have included today are seen in the Porsche Dubai configurator. I thank Naser Alharbi for graciously sending me the information on them! Another leather option expected to be announced in the next few months is leather interior sills! They do not appear yet in any Configurator to my knowledge. But they are coming! I will resume my discussion of Interior Leather Choices on my next post! My last day in Vail before I return to Carmel! "On the 981 there are two different two tone interiors. One is very similar to the 991. Order a Leather interior and a Two-Tone choice of two colors, Agate Grey/ Pebble Grey or Agate Grey/ Amber Orange. This includes deviating stitching on the dash and doors...The second option which I believe is unique to the 981 is to order the Partial leather seats with leather package and a Two-tone Leather Package in one of three colors, Agate Grey/ Pebble Grey, Agate Grey/ Amber Orange or Agate Grey/ Lime Gold. This gives a very different look...the dash and the majority of the door panels are not covered in leather and there is no deviating stitching...a very subtle difference in the order can have dramatically different results." This is all very true and you should carefully study what 'Partial' leather offers you, because many will not find it very attractive! Below are photos I just took on Wednesday at 'Porsche of Colorado Springs' of a 981 with Dual Tone 'Agate/Pebble Grey' full leather interior. This 'full leather' option will always be the more desirable one in the 981! Now if I could only see that interior with anthracite brown! !